I don’t drink much cola these days, my beverage of choice for the last year has been straight tea — I drink about 4-5 cups of it a day. However, when I do drink cola it has to meet some criteria. 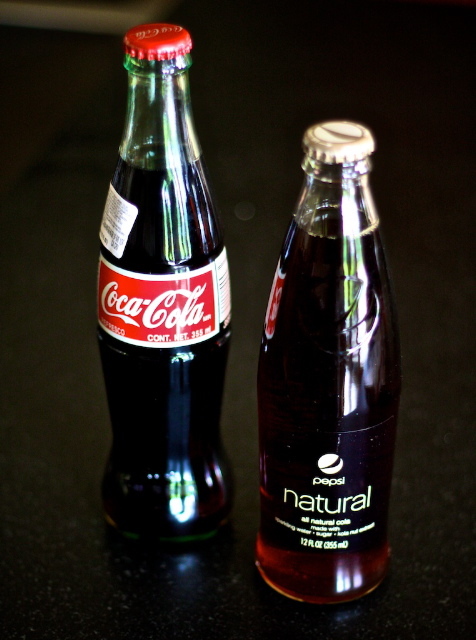 The soda needs to be the kind without High–fructose corn syrup (HFCS) and in glass bottles. To my delight, while picking up my supply of mangos from Costco, I saw that Pepsi has released a new drink called, “Pepsi Natural“. This all natural cola is made with sparkling water, sugar and kola nut extract! I just popped open a bottle and it actually takes pretty, pretty, good! Now, when guests come over to the Grouse, they can have their pickings of Mexican Coke, Pepsi Natural, Dry Soda, and S. Pellegrino all in glass bottles which are recycled after consumption — now if only we could get the bottles refilled! ?